As a long-standing customer and fan of the City Business Library dating back to my City days, it is good to see them back in business after a move from their previous location. It is good news on many levels. Before the move they were almost impossible to find in one of the many City of London (also known as the Square Mile) winding back streets. Also they were located in the a basement, which made for a somewhat oppressive atmosphere due to a lack of natural light. Now they have moved into Guildhall, which is the headquarters for the City of London (previously known as the Corporation of London). Along with the move they now have a shiny new set of library and IT equipment, making for a very impressive space. 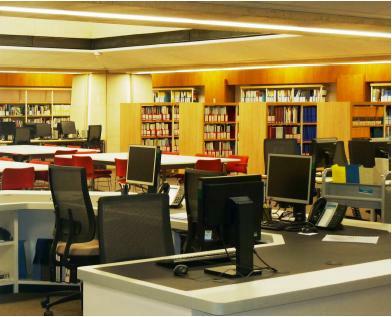 The City Business Library has moved to Guildhall. The City Business Library is a public reference library specialising in current business information which is intended to be of practical use. If you need information more than five years old, or you are interested in business history, we advise you to contact Guildhall Library. If you wish to consult student textbooks, theses and dissertations or academic journals we advise you to contact an academic library. We have electronic and printed information on both British and foreign companies. We subscribe to a number of company information database which you can use free of charge in the library. We have market research reports for both the UK and foreign markets, with an emphasis on consumer goods and services. Many reports are now published only in electronic format and are only available via online subscriptions. However, you can view them free of charge in the Library. Please note that any copying, whether downloading / printing from the databases or photocopying from printed material must be within the Copyright law. City Business Library RelocationThe City Business Library has moved to Guildhall. This entry was posted in business information, market research on 19 February 2010 by ninfield.